Leading off this week’s column: We’re gonna jolt you into Monday with this IDEAL Electrical post about some shocking truths about electricians. When it comes to cell phones, flat and thin is in. Tektronix’ post tells of a new, groundbreaking smartphone camera lens that is 10 times thinner than a human hair. Agilent Technologies’ post touches on their connection to Abraham Lincoln and how their technology is being used to answer a question about the health of our 16th president. If you think everyone has a mobile device nowadays, you ain’t seen nothing yet. This JBC Soldering post predicts there will be one billion new mobile subscribers by 2020. Many consider a perfect cup of coffee to be a work of art. Make: Magazine’s post shows us that there’s now a machine that prints works of art…with 8,000 drops of coffee! 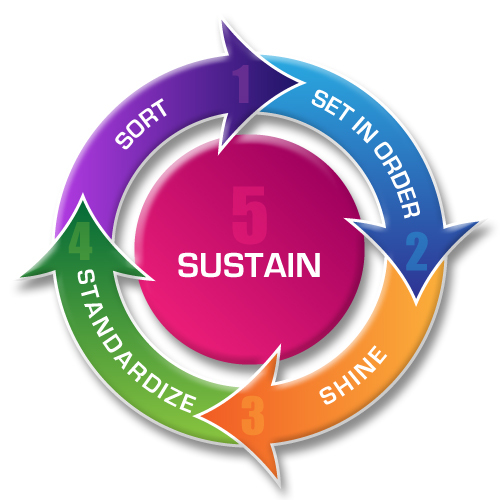 And we close out this week’s column with a look at our blog post about Q Source’s Lean/5S/Visual Inventory resources. 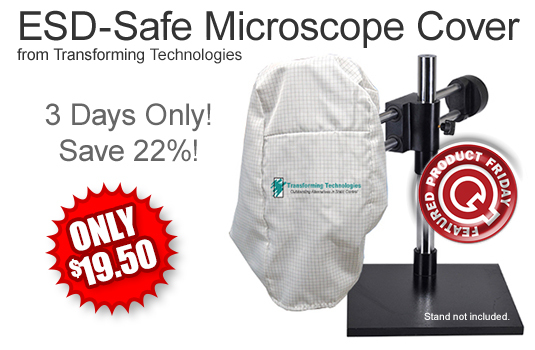 Save 22% off the Q Source price of Transforming Technologies’ ESD-Safe Microscope Cover (White). Just use our FPF022616 Coupon Code (auto applied) to get the discount. This Featured Product Friday (FPF) promo is valid from today, February 26, 2016 through Sunday, February 28, 2016 and the code is unlimited use. The MC1221W Microscope Cover protects the microscope from dust and other contaminants and is constructed from ESD-safe materials that won’t generate a significant charge. For further questions about Featured Product Friday, please read our informational blog post, call us (800-966-6020), or send us an email. Please note: This promo is valid only at QSource.com and expires on February 28, 2016. Lean/5S/Visual Inventory Control, and other organizational/productivity systems are in place at a large number of workplaces across the country. With the pressure to be more productive and more cost-efficient, there’s no doubt that number will grow. With that in mind, we offer this compilation of Lean-related content we’ve created here at the Q Source Resource. The following blogs and Guest Blogs focus on ways you can implement, or more efficiently use, Lean/5S/Visual Inventory practices in the workplace. 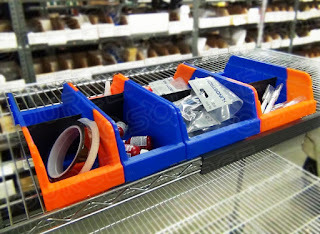 From software to shelving bins, these blogs, Guest Blog, and video offer information about useful products for your Lean/5S/Visual Inventory systems. Akro-Mils Indicator™ Bins for 5S Process & Lean Manufacturing - Q Source, Inc.
For more information and to purchase any of these products, please visit QSource.com. You may also contact us by phone (800-966-6020) or email. Leading off this week’s column: We love posts that show how things are made such as this cool Valutek look at nitrile gloves. Check out this 3M post about “The Grammy Man.” He doesn’t sing or play the guitar; his instrument is Trizact abrasive. The road to clean energy? Workrite Ergonomics shared this post about a French project to pave roads with solar panels, which will create power for up to 8% of the country. "...The experiment could provide clean power for up to 8% of the country's population..."
Future Martian settlers won’t have all the typical conveniences of life on Earth, but this 3D Printing Industry post looks at how 3D printing will provide the ability to create various objects as needed. We love science and we love chocolate: This Laughing Squid post is a cool combination of the two. And we close out this week’s column with a look at our new blog about Brady’s New BBP30 Label Printer. Save 5% off the Q Source price of Waterloo Industries Tool Chests. Just use our FPF021916 Coupon Code (auto applied) to get the discount. This Featured Product Friday (FPF) promo is valid from today, February 19, 2016 through Sunday, February 21, 2016. 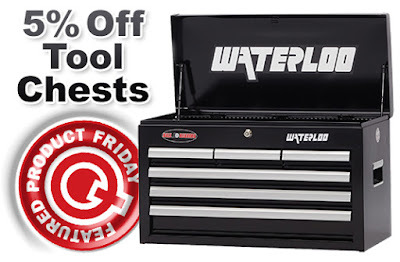 Waterloo Tool Chests are manufactured to be durable and versatile enough to store a variety of tool sizes and lengths for use in a number of industries. For further questions about Featured Product Friday, please read our informational blog post, call us (800-966-6020), or send us an email. Please note: This promo is valid only at QSource.com and expires on February 21, 2016. Fans of Brady’s popular MiniMark™ Label Printer (which becomes obsolete following the introduction of the BBP30 printer.) will be excited to hear about Brady’s newest printer: The Brady BBP®30 Label Printer. The BBP30 offers updated technology and a compact design that give it the versatility to be used in a wider range of applications. Positioned as an entry-level label printer, the single-color BBP30 is great for pipe markers, shelf and bin labels, GHS labels, arc flash labels, warning and danger labels. Using existing B30 consumables, the BBP30 offers versatility for use in maintenance, operations, and safety applications. The BBP30 offers a compact, space-conscious design, fast print speeds for better production, compatibility with Brady’s Workstation label apps, easy-to-load tapes and labels, and ribbon cartridges that snap into place and eliminate the possibility of incorrect installation. 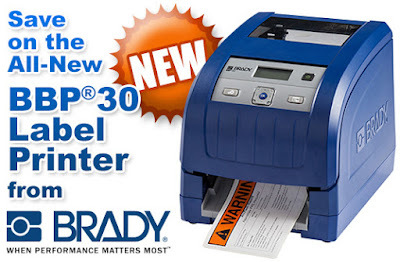 For more information, and to purchase your own BBP30, please visit our Brady BBP30 Label Printer page at QSource.com. You may also contact us by phone (800-966-6020) or email. Leading off this week’s column: TE Connectivity was one of many posters about the Lunar New Year. It’s the Year of the Monkey…we’ll avoid the banana jokes. Agilent Technologies posted about CTE, the increasingly more common brain injury impacting many athletes in a variety of sports. Can 3D printing help us learn about the human race’s past? This 3D Printing Industry post looks at a study of a 5’5”-tall printed copy of Ötzi the Iceman, a 5,000+-year-old mummy. Ever wonder how CSI teams preserve and transport DNA samples to the lab from the crime scene? Puritan’s post looks at the proper techniques. And we close out this week’s column with a look at our new promo for Unitron’s enFOCUS Digital Magnifier. Save 10% off the Q Source price on select in-stock, ready-to-ship Lindstrom Cutters & Pliers. Just use our FPF021216 Coupon Code (auto applied) to get the discount. This Featured Product Friday (FPF) promo is valid from today, February 12, 2016 through Sunday, February 14, 2016. 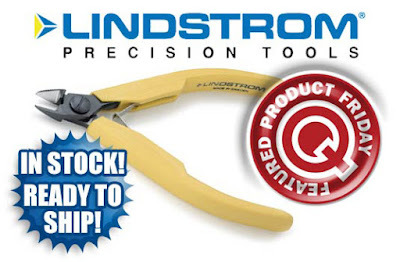 These popular Lindstrom Cutters & Pliers are manufactured to be durable, quality tools that fit a wide range of applications. Please see each individual tool’s product page for more detailed information. For further questions about Featured Product Friday, please read our informational blog post, call us (800-966-6020), or send us an email. Please note: This promo is valid only at QSource.com and expires on February 14, 2016. Bevco’s ErgoLux Backless & Backrest Soft Poly Stools are designed to provide extreme comfort and stress relief. And, with our limited-time offer, you can save an extra 10% off our already low prices, while getting fast five-day delivery of these durable polyurethane stools. Are Bevco’s ErgoLux Stools custom-made for you? No, but with the way they respond to your body’s unique shape, weight & temperature you’ll swear they were. Created with a super-soft, extra-thick, supportive 3.5” visco-elastic memory foam with a 14.5” diameter seat with 360° swivel that supports up to 300 lb. ; ErgoLux Stools really deliver a comfortable experience. Q Source’s exclusive special offer Bevco’s ErgoLux Stools expires on March 31, 2016. Please visit our promo page at QSource.com to place your order for these ergonomically superior stools. You may also contact us by phone (800-966-6020), email, or via our Web site. Leading off this week’s column: In case you missed it, American Hakko shared this post about Punxsutawney Phil the groundhog predicting an early spring. JBC Tools shared this informative post about how to solder the right way. Check it out if you’re new to soldering or looking to increase your knowledge. Did you know that our minds wander almost half the time during our workday? Workrite Ergonomics shared this interesting article about daydreaming and how one can retrain their brain for better focus. "...Our brains aren't designed for the type of work we do, which is why we're always distracted. But two rules can help you retrain your brain..."
Zebra Technologies posted about how the NFL’s Player Tracking System using RFIDs to record every players’ every move, could someday be applied to all of our jobs. Does the idea of traveling over 700 MPH in a sealed tube appeal to you? Then check out this post from Mashable about Elon Musk’s predictions for Hyperloop, a high-speed global transportation system. And we close out this week’s column with a look at our blog about an important new firmware upgrade for Brady’s popular BBP35 and BBP37 printers. Have you seen Unitron’s new enFOCUS Handheld Digital Inspection Magnifier yet? This state-of-the-art, award-winning portable inspection tool provides a crystal clear image while inspecting hard-to-reach areas. As an introduction to this cool, new magnifier, you’ll get a FREE carrying case (a $159 value) and a special savings discount through April 30th, 2016. Our limited-time promotion gets you the FREE Unitron 14822 enFOCUS Hard Carrying Case, which protects the enFOCUS Handheld Digital Magnifier during transport or storage. Plus, you’ll also get special savings on the enFOCUS Magnifier. Please visit our Unitron enFOCUS Handheld Digital Magnifier promo page at QSource.com to make a purchase and get your FREE hard carrying case. You may also contact us by phone (800-966-6020) or email. Please Note: Special promotion ends April 30th, 2016. Attention Brady BBP®35 and BBP®37 printer users: If your printer was manufactured before 12/28/15, click here to download a new firmware upgrade. Brady BBP35/37 printers shipped after December 28, 2015 will include this new firmware version. Brady's BBP35 Multicolor Sign and Label Printer and BBP37 Multicolor Sign and Label Printer w/Cutter are available at QSource.com. 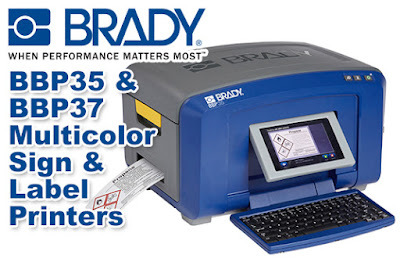 We also offer a complete selection of other Brady printers, materials, and accessories. Click the link to download the firmware upgrade for Brady’s BBP35 and BBP37 printers. For more info about these printers (or any other Brady product) and to make a purchase, please visit QSource.com. You may also contact us by phone (800-966-6020) or email. Here's a great offer to help you expand your ESD control capabilities. Now thru April 30th, 2016, you'll get a FREE 24" x 48" Static-Dissipative Table Mat Kit (MT4500B) from Transforming Technologies when you buy a BFN-801 AC Ionizing Blower. Perfect for use in electronic assembly, medical device assembly and packaging, and semiconductor manufacturing, the Transforming Technologies BFN-801 Ionizer uses its corona ionizing technology to produce a continuous balanced output of positive and negative air ions to create excellent rapid charge decay for sensitive electronic devices at the workstation. This user-friendly ionizer is uniquely designed to deliver fast decay times with low offset voltages. The MT2448B Two-Layer Rubber ESD Table Mat is constructed of sturdy 2-ply rubber consisting of a conductive layer backing a static-dissipative top layer that provides exceptional electrical performance characteristics. This 4500 Series mat includes two female 10 mm snaps and grounding hardware and is resistant to hot solders, soldering irons, and most solvents. Please visit our Transforming Technologies BFN-801 AC Ionizing Blower promo page at QSource.com to make a purchase and get your FREE MT4500B 24" x 48" Static-Dissipative Table Mat Kit. You may also contact us by phone (800-966-6020) or email. Please Note: Special promotion ends April 30th, 2016. 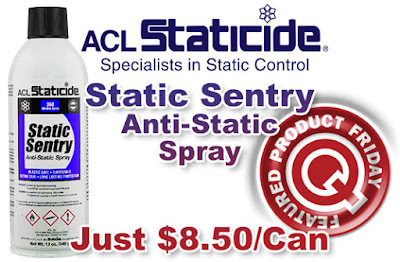 Get FREE Cleaners† and take an extra 5% off* when you purchase ACL Staticide’s new 6800 Series Conductive Chair Mat. This limited-time offer begins today and runs through April 30th, 2016. The ACL Staticide 6800 Conductive Floor Mat (available in three sizes) is created from engineered PVC. The mat’s inherent electrical properties make it impervious to wear damage encountered by moving furniture, scratching, or scuff marks. These black vinyl conductive chair mats are perfect for a desk or long workstation. Our new promo gives you an additional 5% off our already low prices on these ACL Staticide 6800 Conductive Floor Mats. Your discount will be applied after you add a mat to your shopping cart. You’ll also receive a FREE pint of 4030P Ready-to-Use Neutral Cleaner and a FREE package of LF50S Heavy Duty Lint-Free Wipers (5 wipes). Your FREE items will be added to your cart automatically. ACL’s 4030 Ready-to-Use Neutral Cleaner is a low-foaming, multi-purpose cleaner that will not degrade the anti-static properties of the environment. The LF50 Heavy-Duty Lint Free Wipes are perfect for a variety of cleaning applications from everyday use to industrial manufacturing environments.